By Dr. Surat P, Ph.D.Reviewed by Michael Greenwood, M.Sc. 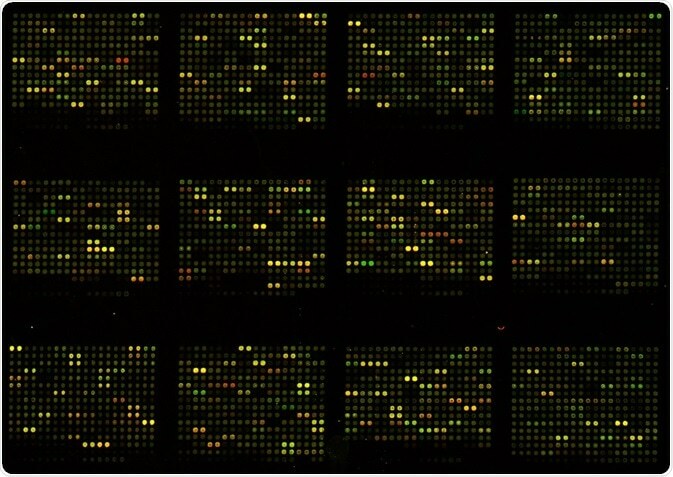 Microarrays have become indispensable for high-throughput analysis. However, microarrays are now being superseded by nanoarrays, which have a higher sensitivity and a simpler methodology. Microarrays are used to detect the expression of a diverse range of thousands of genes. They include microscopic slides that can be printed with a spot of a known sequence of DNA. This sequence then acts as a probe to detect the expression of specific genes. While performing the analysis, reference mRNA is collected and converted to a complementary DNA sequence. Each sample is then labeled with a specific fluorescent probe. For example, the experimental sample is labeled with a red dye, and reference DNA is labeled with green dye. These samples are then allowed to bind to the microarray slide. After hybridization, the process through which the complementary sequences bind to each other, the microarray can be scanned, and the gene expression can be quantified. If the gene expression is higher in the experimental sample, the spot may appear red. Whereas, in cases when the expression in the experimental sample is lower, the spot may appear to be green. Although the microarray has become a mainstay for parallel screening of several nucleic acids and proteins, it has several disadvantages. It requires large sample volumes and long incubation times because of the larger spot size compared with nanoarrays. Microarrays are also limited by detection sensitivity. Traditional microarrays also require large and bulky instruments, and sample preparation requires a large amount of effort during the amplification and labelling stages. All of these processes take time and are expensive. These disadvantages also lead to difficulties in transferring these detection methods to point-of-care applications. Nanoarrays utilize an array of biological molecules that are present in micron or sub-micron sized spots. In this method, one hundred molecular binding sites can be placed in the area that is usually occupied by one microarray spot. The nanoarray can have a spot as small as 500 nm, up to a spot of 2–3 microns in diameter. A nanoreader is an atomic force microscope that is specifically built for the reading of nanoarrays. This is required due to the ultra-miniaturization of nanoarrays. In an atomic force microscope, a sharp probe scans the surface and records the probe and surface interactions. This allows the probe to detect both topography and chemical interactions. This microscope can also operate in solutions. Using this method, an entire nanoarray can be evaluated in 5 to 10 minutes. What are the advantages of nanoarrays? Nanomaterials can provide several advantages with respect to sensitivity, specificity, speed, portability, throughput, and cost. These advantages are accorded due to their small size, which leads to a large surface-to-volume ratio. The physical properties are also chemically tailorable in relation to size, composition, and shape. Nanoarrays possess highly specific target-binding properties and structural robustness. Also, it is an almost completely automated process that reduces the need for skilled manpower, expertise in performing the process, and personnel costs. As the method proceeds in physiological environments, it provides biologically relevant information. How are nanoarrays currently being used? The field of diagnostics is leading the way in terms of using nanoarrays routinely. Being able to carry out diagnostic tests using a small, multiplex assay is extremely beneficial. Multiplex assays can fit onto a single chip, reducing the cost and labor involved in the diagnosis of disease. 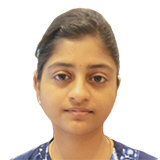 The fields of proteomics and drug discovery are also benefitting from the development of nanoarrays, which allow large scale screening of molecular interactions and drug activity. A large number of target molecules can be immobilized and interaction can be tested with potential molecular partners with reduced reagent and personnel costs. NanoArrays, The Next Generation Molecular Array Format for High Throughput Proteomics, Diagnostics and Drug Discover.